The Catholic Church, also known as the Roman Catholic Church, is the largest Christian church, with approximately 1.3 billion baptised Catholics worldwide . As the world's "oldest continuously functioning international institution", it has played a prominent role in the history and development of Western civilisation. The church is headed by the Bishop of Rome, known as the Pope. Its central administration, the Holy See, is in the Vatican City, an enclave within the city of Rome in Italy. Catholic theology is based on the Nicene Creed. The Catholic Church teaches that it is the One, Holy, Catholic and Apostolic church founded by Jesus Christ in his Great Commission, that its bishops are the successors of Christ's apostles, and that the pope is the successor to Saint Peter upon whom primacy was conferred by Jesus Christ. It maintains that it practises the original Christian faith, reserving infallibility, passed down by sacred tradition. The Latin Church, the twenty-three Eastern Catholic Churches, and institutes such as mendicant orders and enclosed monastic orders reflect a variety of theological and spiritual emphases in the church. The Second Crusade (1145–1149) was the second major crusade launched from Europe, called in 1145 in response to the fall of the County of Edessa the previous year. Edessa was the first of the Crusader states to have been founded during the First Crusade (1095–1099), and was the first to fall. The Second Crusade was announced by Pope Eugene III, and was the first of the crusades to be led by European kings, namely Louis VII of France and Conrad III of Germany, with help from a number of other important European nobles. The armies of the two kings marched separately across Europe and were somewhat hindered by Byzantine emperor Manuel I Comnenus; after crossing Byzantine territory into Anatolia, both armies were separately defeated by the Seljuk Turks. Louis and Conrad and the remnants of their armies reached Jerusalem and, in 1148, participated in an ill-advised attack on Damascus. The crusade in the east was a failure for the crusaders and a great victory for the Muslims. It would ultimately lead to the fall of Jerusalem and the Third Crusade at the end of the 12th century. 6th century mosaic in Ravenna portrays Jesus dressed as a philosopher king in a cloak of Tyrian purple. He appears as the Pantokrator enthroned as in the Book of Revelation, with the characteristic Christian cross inscribed in the halo behind his head. Pope Benedict XVI (Latin: Benedictus PP. 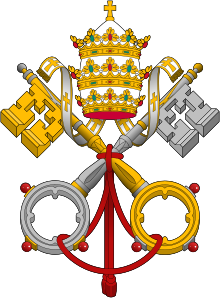 XVI; German Benedikt XVI. ; Italian: Benedetto XVI, born Joseph Alois Ratzinger on 16 April 1927) was the 265th Pope, the spiritual head of the Catholic Church, and as such, Sovereign of the Vatican City State, until his resignation was effective, on 28 February 2013. He was elected on 19 April 2005 in a papal conclave, celebrated his papal inauguration mass on 24 April 2005, and took possession of his cathedral, the Basilica of St. John Lateran, on 7 May 2005. Pope Benedict XVI has both German and Vatican citizenship. He succeeded Pope John Paul II, who died on 2 April 2005 (and with whom he had worked before the Sede vacante). Benedict XVI was also the Bishop of Rome. Benedict XVI is a well-known Catholic theologian and a prolific author, a defender of traditional Catholic doctrine and values. ...that according to his hagiography, Saint Severus of Naples (pictured) temporarily brought a man back from death in order to testify on the size of his debt and save his widow from slavery? ...that at the Council of Acre in 1148, the decision was made to attack Damascus, leading to the failure of the Second Crusade? ...that the concentration ability of Augustine Fangi reportedly allowed him to undergo an operation without anesthetic and feel nothing? Marie of the Incarnation, (born in Paris, February 1, 1566; died at Pontoise, April 1618) known also as Madame Acarie, was foundress of the French Carmelites. By her family Barbara Avrillot belonged to the higher bourgeois society in Paris. Her father, Nicholas Avrillot was accountant general in the Chamber of Paris, and chancellor of Marguerite of Navarre, first wife of Henri IV of France; while her mother, Marie Lhuillier was a descendant of Etienne Marcel, the famous prévôt des marchands (chief municipal magistrate). She was placed with the Poor Clares of Longchamp[disambiguation needed] for her education, and acquired there a vocation for the cloister, which subsequent life in the world did not alter. In 1584, through obedience she married Pierre Acarie, a wealthy young man of high standing, who was a fervent Christian, to whom she bore six children. She was an exemplary wife and mother.Pierre Acarie was one of the staunchest members of the Catholic League, which, after the death of Henry III of France, opposed the succession of the Huguenot prince, Henry of Navarre, to the French throne. He was one of the sixteen who organized the resistance in Paris. The cruel famine, which accompanied the siege of Paris, gave Madame Acarie an occasion of displaying her charity. After the dissolution of the League, brought about by the abjuration of Henry IV, Acarie was exiled from Paris and his wife had to remain behind to contend with creditors and businessmen for her children's fortune, which had been compromised by her husband's want of foresight and prudence. July 26, 2017: The Holy Name of Jesus cathedral in Raleigh, North Carolina was dedicated. The groundbreaking took place on January 3, 2015. May 21, 2017: Pope Francis announced a consistory for the elevation of five new cardinals on 28 June. He adhered to his established pattern of appointing cardinals from the peripheries, including the first cardinals from El Salvador, Laos, Mali, and Sweden, the latter of whom will also be the first cardinal from Scandinavia. April 12, 2017: Pope Francis expanded the Secretariat for Communications and appointed the 13 new consultants in addition to the 16 members added on July 13, 2016. The secretariat was established in June 2015. December 8, 2015 to November 20, 2016: During the Extraordinary Jubilee of Mercy, Rome received 21.3 million pilgrims, the shrine of Our Lady of Guadalupe received 22 million pilgrims, and World Youth Day in Krakow received 3 million pilgrims.